Carole — Piano. Push. Play. Inspired by the sculptures outside the Portland Art Museum, along with the vibrant colors and joyous sounds of Portland summers, staff at SERA Architects sought to create an interactive and whimsical experience for its piano design. As music radiates from the gramophone flowers atop the piano, it ‘drips’ down the piano to activate a colorful light display. Powered by a solar panel butterfly, the lights celebrate the Northwest’s long summer days. SERA is an employee-owned architecture, interior design and urban design & planning firm founded in Portland in 1968. SERA holds a key role in the city’s national reputation for livability and sustainability with marquee projects such as Montgomery Park, the Edith Green – Wendell Wyatt Federal Building and the Washington High School redevelopment. 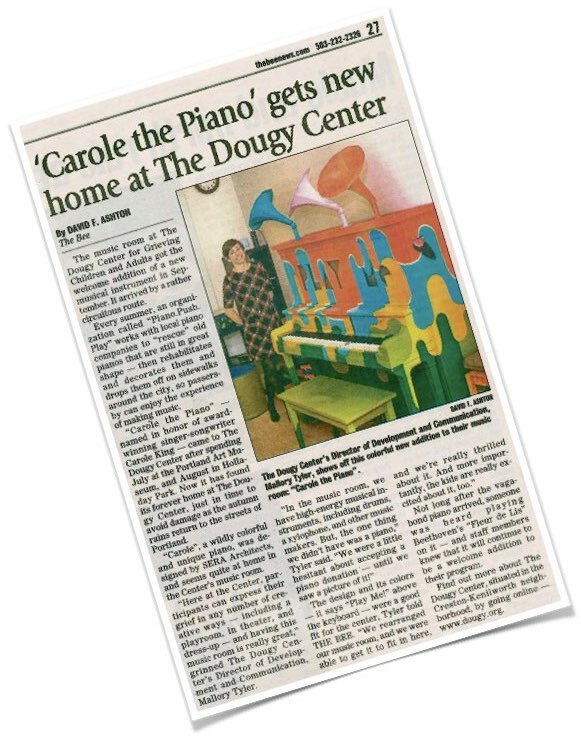 The wildly colorful Carole has found a forever home at The Dougy Center for Grieving Children and Adults. "Here at the Center, participants can express their grief in any number of creative ways – including a playroom, in theater, and dress-up – and having this music room is really great," grinned The Dougy Center's Director of Development and Communication, Mallory Tyler. "...We were a little hesitant about accepting a piano donation – until we saw a picture of it!"